Last week, the latest in the ever-growing line of DC Universe Animated Original Movies was released. I picked it up and, somehow, even managed to watch it. With these DC releases, there’s usually very little middle ground—I’ve bought a number of them, and it’s been my experience that a title is either quite good or quite bad. Either the movie works, or it doesn’t. In the case of Justice League: Doom, everything definitely works. The characters mirror their comic book counterparts nicely, the voice actors are spot-on, and there’s that perfect mix of action, interesting plot, and witty dialogue that is lacking in so many comic book-to-film adaptations. DC gets that the people buying these DVDs—which are often rated PG-13, by the way—understand who their characters are, and as such, the audience can be thrown right into a story without any background. And when you’re trying to tell a fast-paced super hero story, any time wasted on pointless introductions only succeeds in sucking the life out of the film’s momentum. 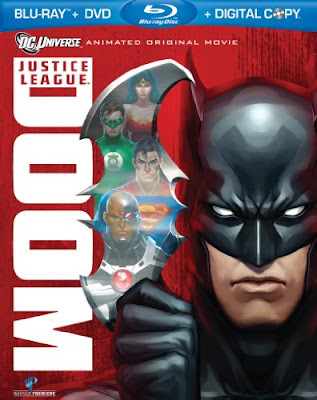 Adapted from the new-classic JLA story “Babel,” Justice League: Doom features the final screenplay written by the late, great Dwayne McDuffie, and it's heavy on both character moments and great action beats. Doom is the story of what happens when Batman’s JLA contingency plan--a detailed rundown of how The Dark Knight would take down each one of the members of The League in the event they were to go rogue--is stolen by the League’s greatest enemies. What results is a harrowing example of what can go wrong for the good guys when the bad guys get everything right. There are legitimate "oh-uh" moments in the flick, and on more than one occasion I just wasn't sure how the good guys would prevail. In a medium where we know the outcome of pretty much every story we're told, that's saying something. McDuffie, as he'd done so many times in his too-short career, turned in something that was both thought-provoking and punch-you-in-the-face exciting--the perfect balance for a a good, solid super hero story. So I can say quite loudly that Justice League: Doom receives the Official Exfanding Stamp of Approval. So you know it's good.